Extend your signal with the best WiFi range extenders, and keep yourself connected wherever you are in the home. While once a luxury, a network to connect your computers and other devices has become critical in everyone’s home. While it's best to have your gaming PC connected via Ethernet wires for an optimal experience, there are plenty of situations where there are obstacles to this. That's where you need to invest in one of the best WiFi range extenders, because your connection is a vital part of your set-up. With the best gaming routers, it is significantly less painful to play over WiFi than it was a short decade ago over earlier generations of wireless gear. Also, users have an increasing number and array of connected devices beyond their main gaming rig to get connected via their wireless network. But even with the latest routers, there are plenty of situations where the WiFi signal is not adequate throughout the entire house. Examples of this include interference from neighbors' wireless networks, large residences especially with multi-levels, and issues from the type of construction, such as denser materials like brick or concrete walls and floors. 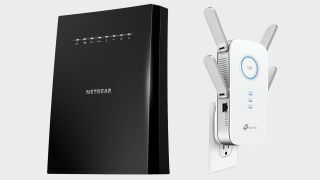 Check out our choices for the best network extender below, and fix that wireless deadspot by building out your network. TP-Link offers a variety of wireless extenders, and this TP-Link AC2600 Wi-Fi Range Extender (RE650) is their top entry into the extender space. This model has tops specs when compared to the lower models, with AC2600 speeds (N800 + AC1733), and four external antennas. We also like the integrated Gigabit Ethernet port on this extender that facilitates use of this as a wireless bridge, or access point, providing the user with flexibility as they build out their network. This extender has the option to transmit the same SSID, even with routers of a different manufacturer, allowing this RE650 function as a ‘pseudo-Mesh’ node. We’ll just get it out of the way, and say that the throughput tests on the 2.4 GHz frequency are quite lackluster. However, the 5 GHz tests are the standout, starting with the Speedtest download of 132.91 Mbps, the best throughput we saw from any of our smaller extenders. On our gaming test, the 69+ FPS, and dropped frames of <1% on our streaming 4K video on the 5 GHz frequency totally matched the baseline benchmarks of our wired Ethernet connection. Furthermore, the RE650 is the only compact extender to do this feat. Therefore, according to our testing on our real world benchmark tests, the experience with the RE650 is actually the same as gaming while connected with a wire using this extender. This great performance, coupled with the over 14,000 reviews on Amazon that give it four stars, and the affordable price make the TP-Link RE650 our top recommendation for a wireless network extender. Most of these other extenders go for the unassuming, plug into the outlet approach, with a few small antennas, for their design. Taking this 180 degrees, this Netgear Nighthawk X6S goes for a desktop monolithic design of a larger tower of black plastic, and keeping the antennas internal. The benefit of the larger unit is that there is plenty of room for additional features, including four Gigabit Ethernet ports, a quad core processor, and a USB 2.0 port that supports ReadySHARE Print. The wireless specs check all the right boxes, including Tri-band support that uses one of the 5 GHz frequencies for dedicated backhaul to the router dubbed FastLane3, Beamforming+ for better range and throughput, and an Access Point mode. On our testing suite, the Nighthawk X6S performed strongly across many of our benchmarks. Starting with the download test, on the 2.4 GHz frequency we clocked 57.38 Mbps of throughput, and on 5 GHz it managed a ridiculously fast score of 193.08 Mbps- the fastest seen of any extender. In addition, the upload speeds on the extender were close to full bandwidth. On the network gaming congestion test, while connected on the 2.4 GHz frequency, the FPS were 47.65, with a low 2.67% of dropped frames on the streaming video. When connected via the 5 GHz frequency, the scores are even more impressive with FPS of 66.217 on the game, and a really low dropped frame rate of <1% on our simultaneously streaming 4K video. This makes the Netgear Nighthawk X6S a great choice for those looking for a full sized extender, and are willing to pay the higher price for the excellent feature set. The Linksys RE7000 wireless extender offers AC1900 (N300 + AC1733) speeds, and can boost range by up to 10,000 square feet. The antennas are internal, giving the RE7000 a compact size. It also supports the same SSID, but only when connected to a Linksys router, which gives it the behavior more like a mesh node, than a typical add on extender. There is an integrated Gigabit Ethernet port, which allows the RE7000 to function as a wireless bridge or as a wired access point giving flexibility in deployment. Finally, it supports Beamforming, MU-MIMO, and has dedicated backhaul to the router on the alternate frequency via Linksys’ Cross Band technology. The RE7000 did quite well on the 2.4GHz download test with a speed of 55.32 Mbps, although it lagged the competition at 5GHz, but had a still serviceable 90.57 Mbps of download speed. In our network congestion testing, with a simultaneous video stream, the RE7000 had FPS on the 5 GHz frequency at 54.443 FPS. The simultaneously streamed 4K video had a low dropped frames of 1.14% on 5GHz. The RE7000 is our original best pick among wireless extenders, and it remains a capable product, although it is weaker on some benchmarks. We also like the lower price, which makes the RE7000 a good budget pick. We focused on real world testing, in a residential location with a consistent Wi-Fi deadspot, which translates to poor performance both when PC gaming, and when streaming video. We used each of the adapters on Speedtest, on both the 2.4 GHz and 5 GHz tests, to see how the bandwidth got affected. This also exposed issues with the extender’s backhaul solution. In addition to the throughput measured, we were also able to see how latency gets affected via the ping result. We next applied a network congestion model of simultaneous gaming and streaming video on the network, all going through the extender. The game is Medal of Honor: Pacific Theater, played on high game settings with a 720p resolution, measured via FRAPS software to quantitate average, minimum and maximum frame rates, with each of the extender solutions, and a comparison to baseline. We also used PingPlotter 5, both to quantitate latency spikes of over 100 ms when connected to the extender with simultaneous gaming and video streaming, and also ran their ping tests which connect to www.google.com, and provide a latency measurement across time to identify general web surfing connectivity issues. The streaming video was provided by a single 4K YouTube video. Using the “Stats for Nerds” tool that YouTube provides, it was verified that the video was streaming at the full 4K resolution. Dropped frames were measured against the total frames streamed for the clip, and this was expressed as a percentage of dropped frames, with lower numbers being preferred.